Exchange 2003’s end-of-life: how many users does it impact? I’ve been writing a lot about Exchange 2003 reaching its end of life on April 8th. So much so, in fact, that I’ve had some readers ask me why I’m so anxious about this milestone. I’ll tell you who: 6.3 million users in small and medium-sized businesses in North America. This number comes from the Radicati Group, the leading analyst of Microsoft Exchange and the market that surrounds it. They recently released a report entitled Microsoft Exchange, Office 365, and Outlook Market Analysis, 2013-2017, and it’s fascinating reading for me and all the other Exchange nerds at Intermedia. So, according to the Radicati Group, there are 11.9 million North American business users that are running Exchange 2003—53% of which are SMBs. Here’s what you need to know about Intermedia. We’re not just the #1 Exchange provider outside of Microsoft. We’re also advocates for ALL users of Microsoft Exchange, regardless of how it’s hosted or who manages the server. Business email is our passion. And we want ALL business email users to be fully secure and fully mobile. And this is why we’re so concerned. These 6.3 million business users are going to be insecure on the one hand, but unable to take advantage of the latest mobile technology on the other. As of April 8th, that will no longer be possible for Exchange 2003 users. There’s a staggering number of businesses who now face some very tough choices. If you’re one of them, you can understand your options in our Exchange 2003 Decision Guide. I also encourage you to talk to our experts. 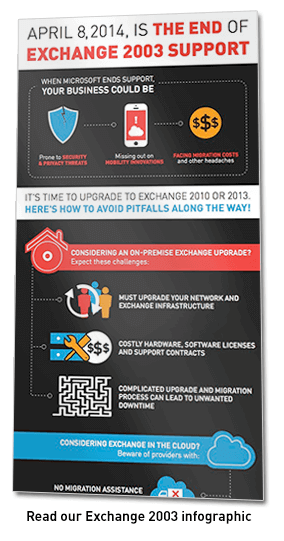 Even if you choose to upgrade your Exchange server on-premises, all of us here want to be sure you’re successful with Microsoft Exchange.